Garlic is one of the most rewarding crops to grow in the garden. It takes very little effort to grow but is frequently used in the kitchen. You’ll spend more time enjoying it in your cooking than tending to it in the garden. Once you learn how to grow garlic, you’ll be hooked! It’ll make you feel like you have your act together every time you reach for a new bulb, and…it makes a lovely homemade gift. On a scarier note, conventional store-bought garlic is often chemically treated, and is therefore one of the most important kitchen staples to swap out for an organically-grown version. I learned how to grow garlic because finding organic garlic was difficult in our area. According to the Toronto Garlic Festival, 75% of the world’s garlic supply is produced in China. Imported garlic is bleached and fumigated for transport. There is nothing organic about chemical bleaching or fumigation. Imported garlic, found in most grocery stores here, is usually white (from the bleaching process), and is less likely to sprout after purchase (due to the fumigation). It can also be identified by the completely removed roots, and will rarely have colourful purple streaks. Because I use garlic so often, and because imported garlic can be so toxic, I now always use organic local garlic. Each bulb of garlic grows from a single clove. Cloves are planted in rich, well-draining soil in September, and then harvested in July. Because you plant it in the fall and then forget about it for the winter, it’s one of the most rewarding, low-maintenace crops. Here in Canada, we grow mainly “hardneck” garlic varieties. Hardneck garlic is generally grown in northern areas, while softneck types are grown in the southern USA. Softneck garlic is great for braiding, great for storing, and has lower chilling requirements. Hardneck garlic however, isn’t great for braiding, but it is very cold-hardy (perfect for our snowy winters). 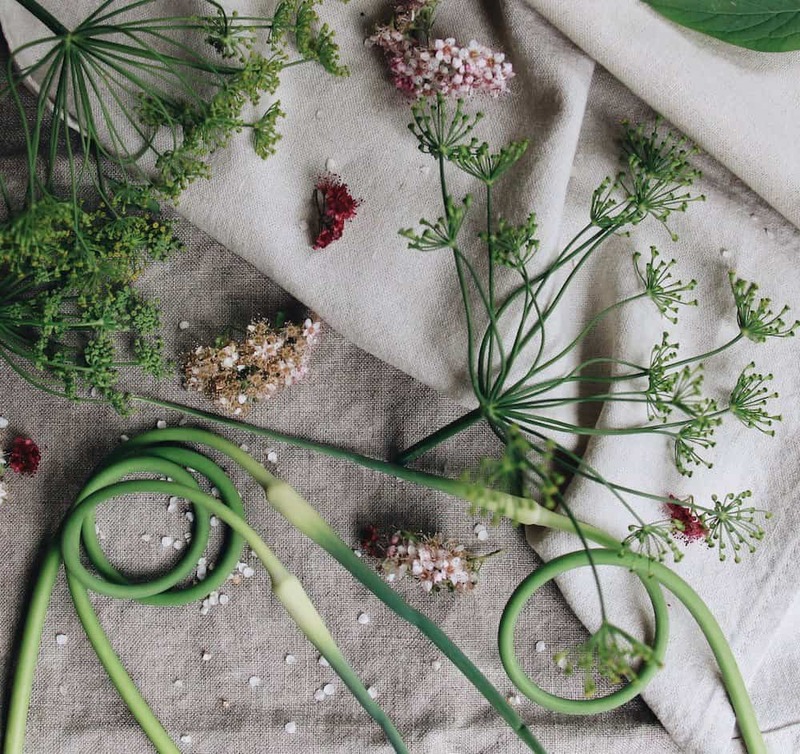 It also includes the added bonus of developing hardneck garlic scapes, an edible flower-like delicacy available for only a few weeks each year. Buy your seed garlic cloves from a local garlic farmer if possible. These bulbs will be adapted to your local climate and will likely be healthier than imported garlic bulbs. 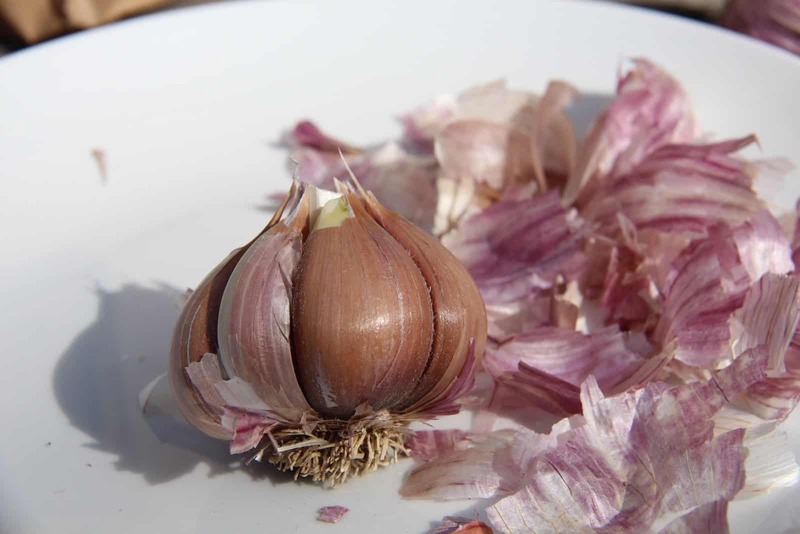 If seed garlic isn’t available in your area, it can also be found online (both hardneck and softneck types). Garlic needs cool weather over the winter to produce large, healthy bulbs. In Canada, garlic is planted in early fall and harvested in early summer. 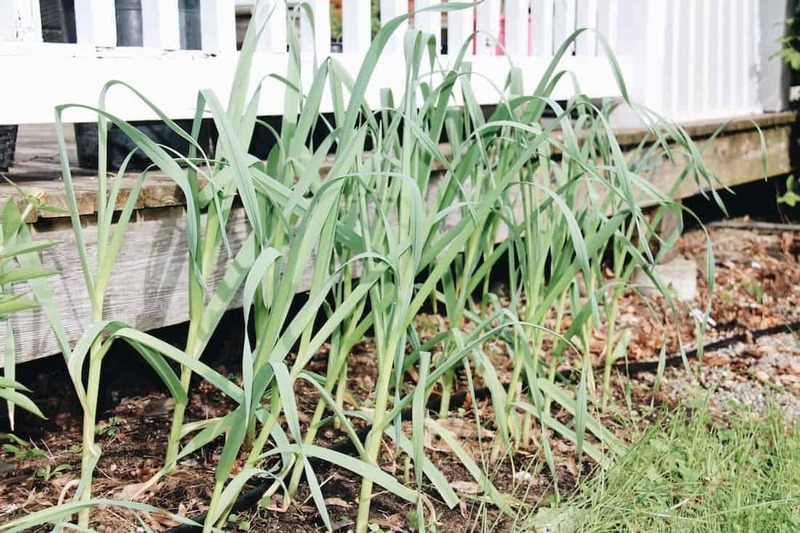 An easy rule-of-thumb to remember when learning how to grow garlic is to plant cloves around the first day of school, and harvest bulbs after the last day of school. Gardeners in southern areas where hard frost is rare can plant garlic in February-March (just pop the bulbs in the refrigerator for a month before planting to fool the cloves into thinking it’s winter). Choose big cloves, like those in the bulbs on the left. Look for locally-grown, organic bulbs of garlic. They’ll be best suited to your region as they’ve adapted to your local climate. 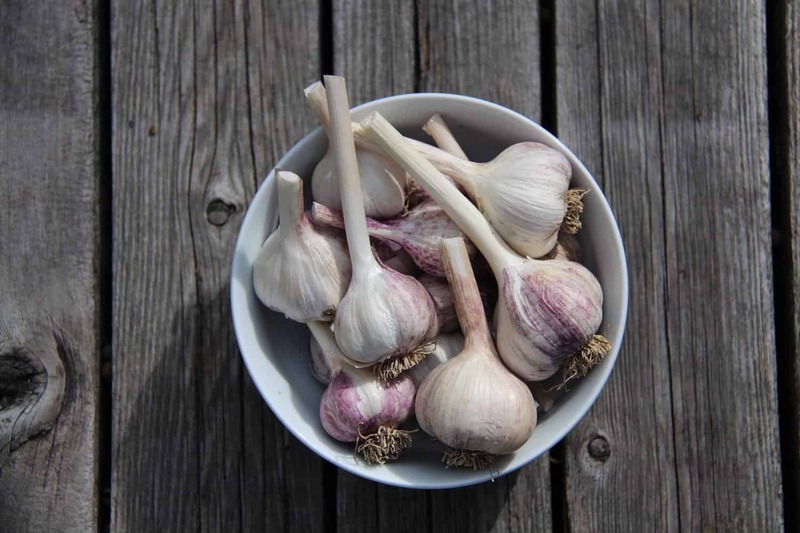 The Farmer’s Market is a great source for local seed garlic, as are independent nurseries. If organic seed garlic isn’t available locally, try online. Select the biggest, firmest, bulbs with the biggest cloves. Big, healthy cloves will produce big heads of garlic. Make sure you consider how much garlic you’d like to grow to ensure you buy enough bulbs. This year I’m growing 24 bulbs of garlic, so I made sure to buy 24 garlic cloves. I bought 4 bulbs of seed garlic to get 24 cloves, costing $8 at our local nursery. 24 bulbs should last us throughout the winter next year. Once I have my own raised garden beds, I’ll likely grow 48 bulbs per year. Choose a location with full sun, meaning that the area receives at least 6 hours of direct sunlight per day. In general, morning sun is preferable to afternoon sun, but any area with a decent amount of sunshine can produce healthy garlic. Choose an area with sandy, well-draining soil. Garlic isn’t happy in clay soil. If you have clay soil, garlic can be grown in a raised garden bed or anywhere that well-draining topsoil has been laid overtop of the clay. Carefully peel the outer papery wrapper off the outside of each bulb of garlic. Only the outer wrapping needs to be removed. The papery wrapping around each separate clove should not be removed. Take special care not to damage the ends of the cloves. Note how the pointy end of each clove is at the top of the bulb, while the flatter ends are attached to the root plate on the bottom of the garlic. The flat end of the garlic produces the roots (remember this when you place the garlic in the ground). Remember which side of the clove is “up”! Measure out enough space to plant your bulbs 6″ apart. Carefully pull out any existing weeds. 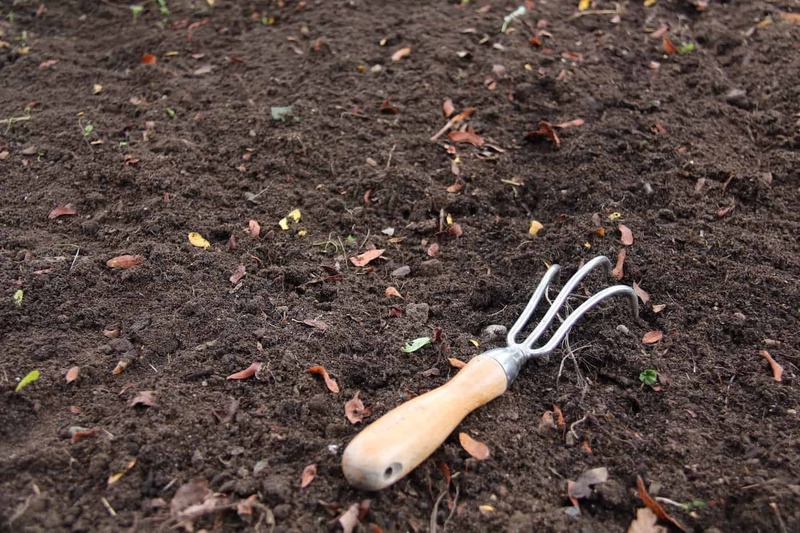 Lay down a 1″ thick layer of compost over the entire planting area. Water the area to moisten the soil before planting. Here in the interior of BC, I plant my garlic in early September. In general, cloves should be planted about six weeks before the first hard frost in your area. Lay out your garlic cloves at least 6″ apart. Dig a small hole for each clove. In areas where snow covers the ground for much of the winter, cloves can be planted 6″ deep. 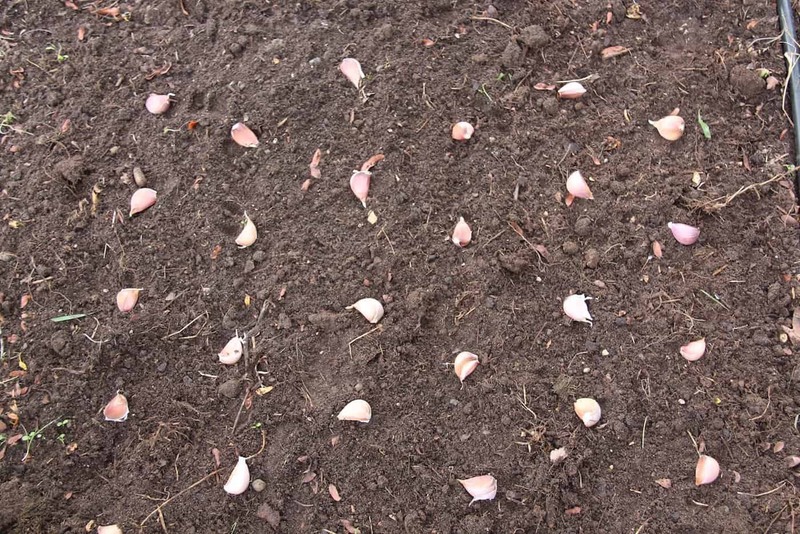 If winters are frosty, but the snow rarely sticks around, garlic can be planted 3″ deep. Drop one clove in each hole with the pointy end up. The bottom of the clove, which produces the roots, should be placed at the bottom of the hole. Cover the holes with soil. Pack the soil lightly to remove air voids, but try to avoid stepping on the area (this will over-compact the soil). Water the area well following planting. Water the garlic once a week until the ground freezes. If the Fall is particularly rainy, you may not have to water the garlic much at all. Once the ground freezes hard, cover the garlic patch with 2″ of well-shredded leaves. We run the lawnmower over some maple leaves a few times, and then place those leaves over the garlic patch. The leaves act as a mulch to protect the bulbs over the winter. The garlic may sprout a little bit in the Fall. If it does, it isn’t the end of the world. Mulch the bed well, follow the remaining instructions, and you should have a decent harvest next Summer. 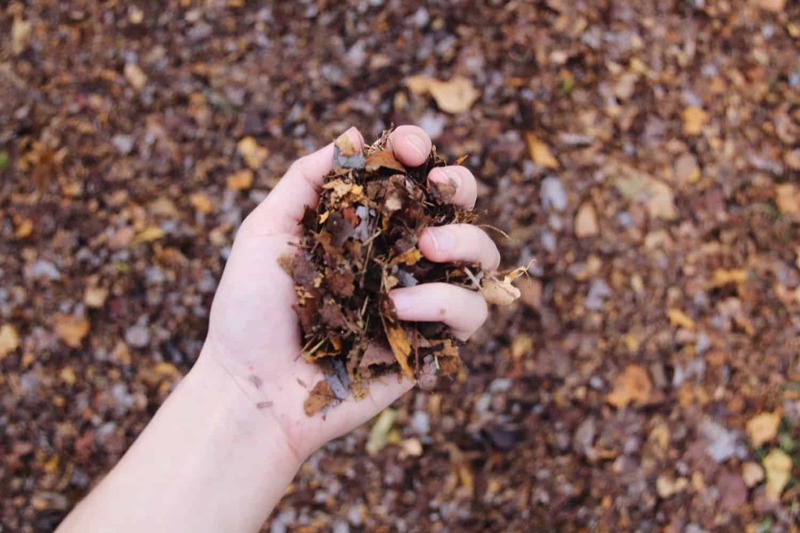 Remove the shredded-leaf mulch when the ground thaws. You can add a thin layer of compost on top of the soil if you have particularly sandy soil that is low in nutrients (like my soil). Watch the ground for small green garlic sprouts. These little sprouts are one of the first plants to appear in the spring. Keep the area well weeded as the bulbs grow. Water the garlic once or twice a week as the garlic plants grow. Leaves will develop first, followed by the flower head, called a “scape“. Garlic scapes are the beautiful, curled tops of young hardneck garlic plants. Clip them off when they make a complete curled circle. Removing the scapes will help the plant dedicate more effort to growing the bulb below ground. 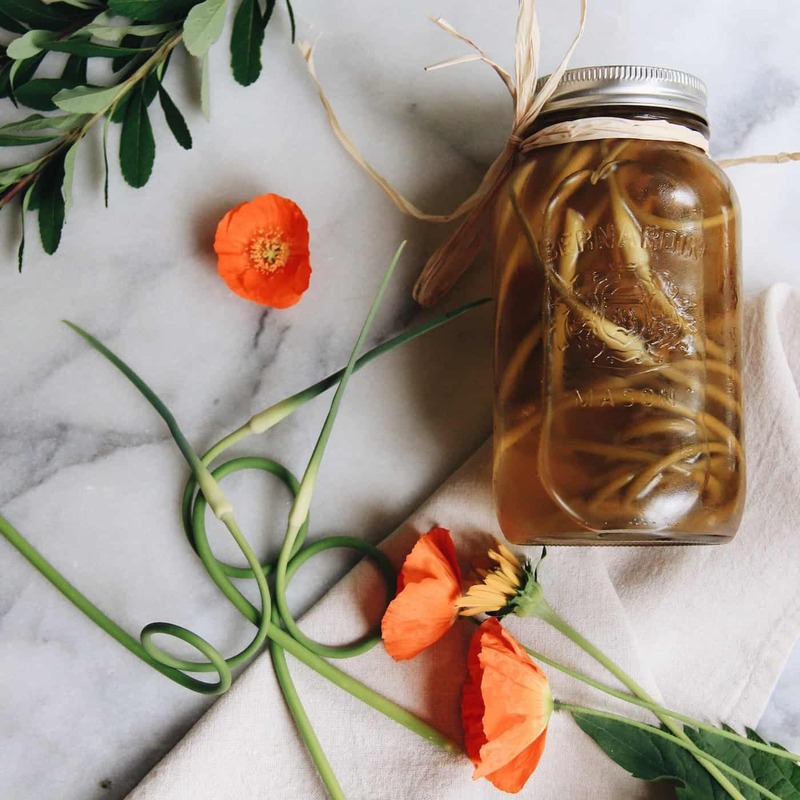 Garlic scapes are delicious fresh, bbq’ed, or pickled. If you don’t clip off the young scapes, they will grow tiny “bulbils”, which are tiny garlic seeds. These seeds will grow garlic in a few years if planted (see bulbil planting instructions here). Watch the garlic for signs that the leaves are starting to turn yellow. Once the leaves begin to turn yellow (this happens in June in our area), stop watering the garlic. This will allow the cloves to start to cure while still in the ground. Leave the garlic in the ground for a few weeks, without watering. Garlic bulbs are ready for harvest when 2/3 of the leaves have turned yellow. Where I live, this usually happens during the first few weeks of July. When the bulbs are ready for harvest, carefully loosen the soil around each bulb using a small pitchfork or shovel. Be careful not to pierce any of the bulbs as you loosen the soil. Gently pull out the bulbs. Brush the bulbs to remove most of the surface soil. Try not to damage the papery wrapper. 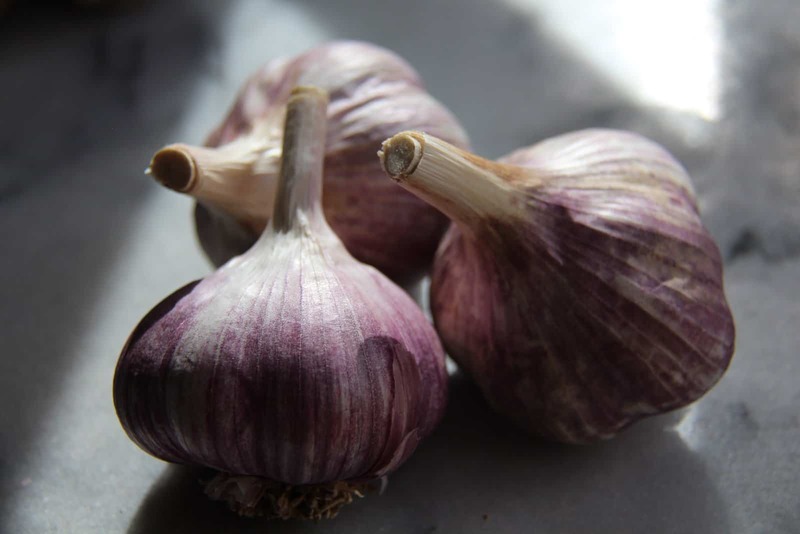 Hang the garlic in groups of 3-6 bulbs for 6 weeks. 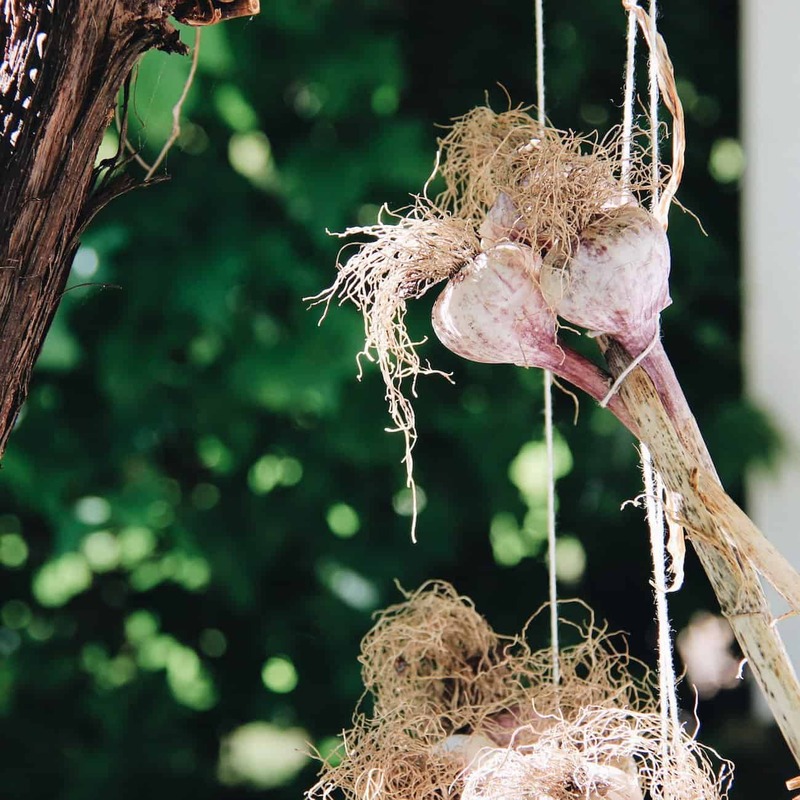 Garlic should be hung in a dry location with a warm breeze. Air circulation is key to the curing process. I hang mine under our grape arbor. Use a fan if the air is still. Once the garlic has hung for at least 6 weeks, cut the stalks a few inches about the neck of the bulb. The roots can also be trimmed. 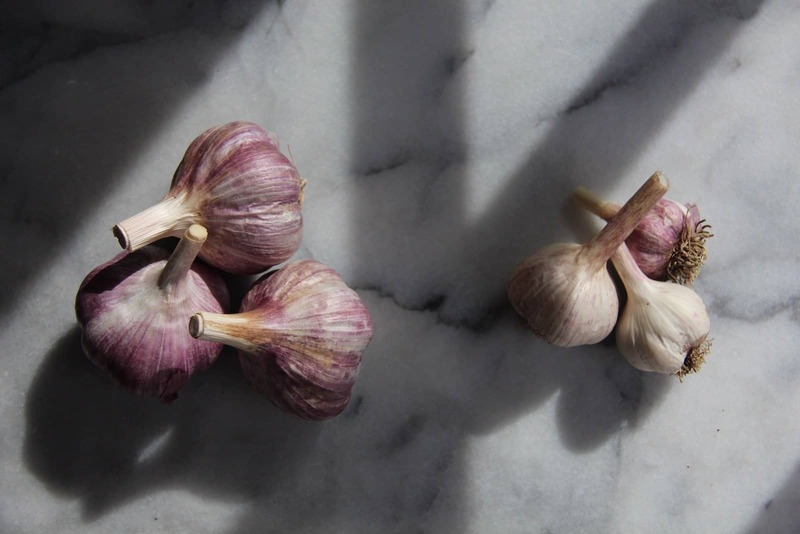 Store garlic in a cool, dark place with ventilation. The fridge is not the place for storing garlic…it requires a dry, breezy environment. Save the biggest, most uniform bulbs for next years crop. Saving your own seed garlic will help the cloves adapt to your local growing environment better than any seed garlic you could purchase. The garlic will be stronger and healthier after a few good growing years. Plant the garlic in a different area of the garden each year to discourage soil-borne disease such as white rot. Growing your own garlic is not hard, but there are lots of steps to remember. That’s why I’ve put together a free set of printable instructions for you to keep on-hand. Print these out so you don’t miss a single step! Keep these instructions with your Garden Planner or leave them on your computer for future reference. Have you tried growing your own garlic? Do you have any questions about how to grow garlic? 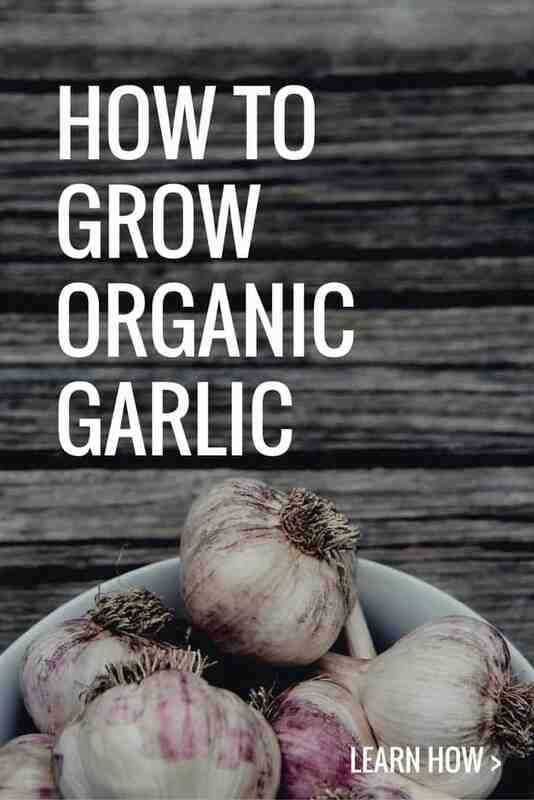 Do you have any tips on how to grow garlic organically? Share your comments and questions in the comments section below! What a great article, it’s like a mini class on garlic. Beautiful job! I think we will start growing garlic this year! We have seen some healthy seed garlic before, and we know it does well here. We will follow your detailed steps! Such a great post! Total newbie-who-doesnt-garden-but-would-like-to question… Could you refrigerate the cloves in February and then grow them in an apartment? Excellent post, thank you so much and keep up the great work! Thank you so much Dishan! I’m glad you enjoyed this post.